Help for Heggs customers waiting for loans to be paid? MESA, AZ — Customers of a Valley car dealership say they are still waiting for payoff many were promised months ago. 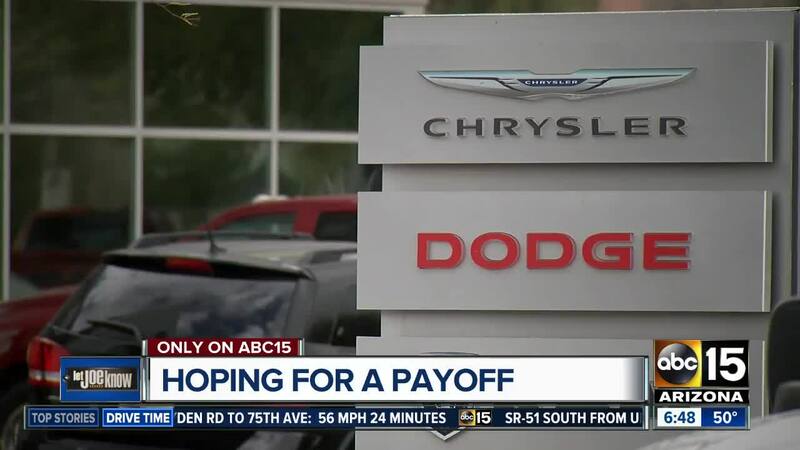 In January, a Let Joe Know report spoke with customers of Heggs Chrysler Dodge Ram in Mesa who say the dealership took their trade-ins and either failed to pay off the loan or took months to do it, often resulting in severe damage to their credit scores, repossession, or paying for a vehicle they no longer have. Jeff and Nydia Delnero say that's what they're stuck doing. "Every time I come here they say well there's nothing we can do about it," Jeff says. Now there might be something customers can do about it themselves. State law requires that all vehicle dealerships in Arizona carry a vehicle dealer bond worth $100,000. The surety is supposed to be available to "respond in damages to any person who suffers a loss" because of a dealership's failure to pay or deliver certain items during a sales transaction. A spokesperson for the Arizona Department of Transportation tells me there is no one comprehensive answer but, "If the vehicle was resold by the dealership and the title could not be released from the lien holder, the bond company may pay the loan depending on a review of the circumstances." After a customer files a claim, the bond company would determine if the claim falls within its coverage. Let Joe Know has learned that Heggs' current bond is set to cancel on February 17, 2019. Owner Alvin Heggs has not responded to our questions about whether or not a different bond will take its place. In the event that it does lapse, Heggs would no longer be allowed to sell vehicles in Arizona during that time.